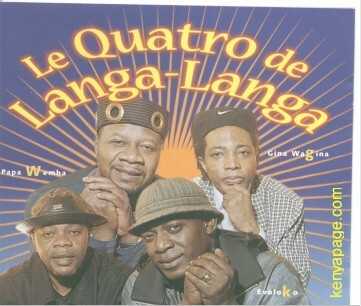 Four of the founder members of Zaiko Langa Langa, clockwise from left Bozi Boziana, Papa Wemba, Jeff Efonge alias Gina wa Gina and Evoloko Jocker. The band was formed in 1970 as Orchestra Zaiko. Original members included Papa Wemba (then Jules Shungu), Evolocko Lay Lay, Zamungana and Nyoka Longo, all in their late teens or early twenties. The group revolutionized Zairean music, adopting a more up tempo beat , abandoning wind instruments and emphasizing the snare drum and the solo guitar. Their music emphasized the sebene. They made great use of the call and response system and introduced chants of animation, a system that is now used extensively by most Zairean groups. Their stage shows were more frenetic and featured a frontline of almost a dozen singers. Musicians used the call and response system as well as animations to get the crowd involved. Much of their material was improvised on the spot. This was in stark contrast to the method employed by most existing bands which employed carefully arranged rhythmic arrangements with harmonic vocal sections . This style while a hit among the youth of Kinshasa , was roundly critisized by the older generation who found it noisy and incomprehensible. The emergence and success of Zaiko led to an explosion of youth oriented groups which sought to emulate Zaiko while targeting the youth of Kinshasa. By 1973, the band had now established itself as one of Zaire’s most popular groups. It now had an array of talented performers each of whom was famous in his own right. They now commanded a fanatical following all over Zaire. Evolocko Jocker emerged as arguably the band’s most popular member, thanks to his flambuoyant, outgoing personality and distictive hairstyle. He is credited with inventing cavacha, the dance craze that swept East and Central Africa during the seventies. Most of the band were from affluent and middle class familes. They sought as much as possible to identify with American culture by fusing elemets of American music into their performances..
One of the distinctive features of Zaiko Langa Langa was the lack of an authoritative leader who had the final say in the day to day affairs of the band. Everyone had an equal say in the bands affairs. As a result everyone seemed to be making their own rules. This was the main reason for the bands volatility. There were frequent misunderstandings among band members , leading to frequent defections and firings. Cracks started to appear and by the mid seventies, it was apparent that the band was falling apart. First to leave was Papa Wemba along with Bozi , Evolocko and Mavuela who formed Isifi Lokole which later split into Yoka Lokole, and Viva La Musica. Lengi Lenga was recruited in a bid to plug the gap left by Papa Wemba. By the late seventies , despite the departure of several stalwarts, the band was at its peak. Among its members were vocalists Nyoka Longo, Lengi Lenga, Bimi Ombale, Dindo Yogo Evolocko and Bozi Boziana along with Instrumentalists Meridjo, and Bapius. Songs were now more polished , arranged and harmonious. Stage concerts were now better choreographed. Western oriented dance styles were replaced with Zairean ones. The band was now winning over all sections of society not just the youth. By 1984, Nyoka Longo being the only original member left in the band, had now taken over as president. The band recorded and toured extensively playing to sold out audiences in Zaire, East and Central Africa and Europe. Then in the late eighties, disagreements occurred among the band members, as veterans, Meridjo, Nyoka Longo and Dindo Yogo lined up against newer band members such as Lengi Lenga, Ilo Pablo and Bimi Ombale. This led to a spectacular split, with Nyoka’s group calling themselves Zaiko Langa Langa Nkolo Mboka, while Bimi’s group called itself Zaiko Langa Langa Familia Dei. Both groups had a decent measure of success and commanded fanatical followings. As the eighties gave way to the nineties, Nkolo Mboka emerged as the stronger of the two Zaiko’s. Infighting among Bimi Ombale and Ilo Pablo sapped the strength of Familia Dei leading to defections. By mid 1996 , Familia dei had all but collapsed. This entry was posted in African musicians and tagged Bozi Boziana, Evoloko Jocker, Nyoka Longo, Zaiko Langa Langa. Bookmark the permalink.